Sending a job offer acceptance letter is a good move by any professional who is accepting a new job. Not only will it create a positive impression in the mind of his employer, but it will also give him a chance to negotiate his salary, discuss his terms of employment and so on. To make it simple, we have a wide range of pre-drafted job offer acceptance letter samples. These Sample Letters are ready to use, easily editable and available in a variety of formats. 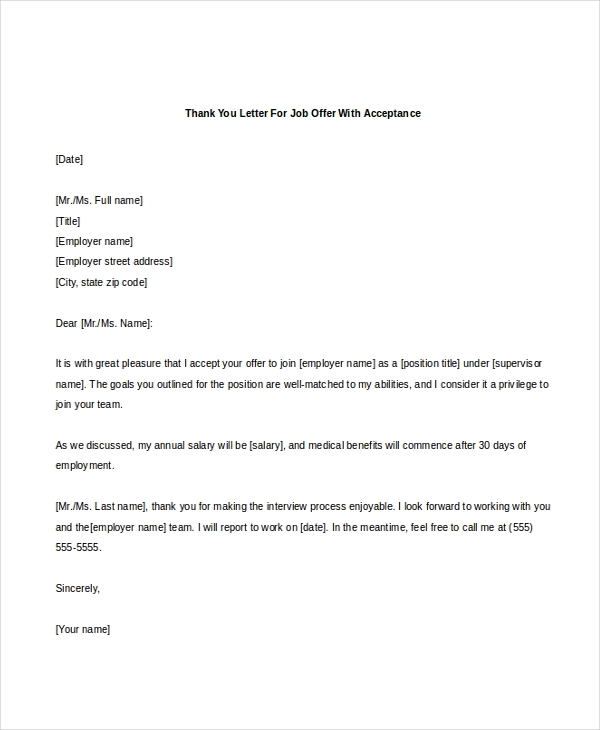 The thank you letter for a job offer with acceptance is a simple template that can be copied, pasted and edited. The name of the employer, name of the firm, position that the professional has been hired for and other details can be added to this template. 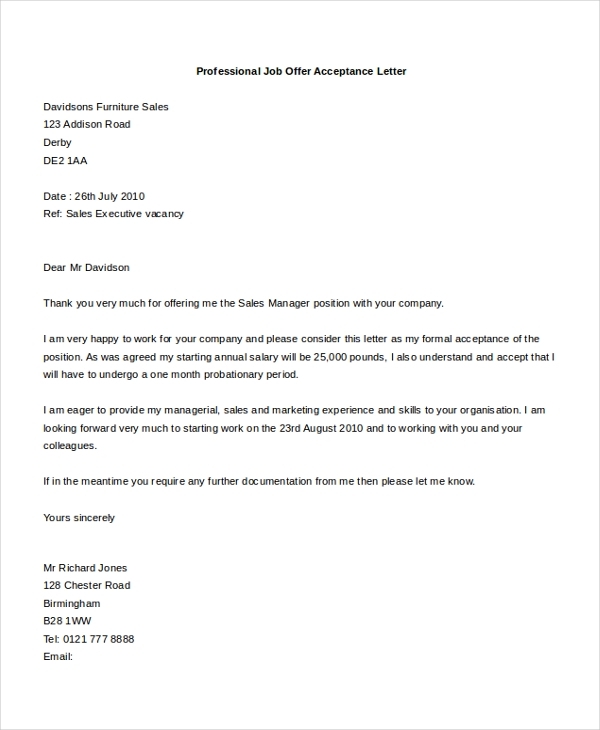 The sample letter to decline a job offer after accepting can be used by professionals who change their mind about accepting a particular job. This sample letter has space for the user to add his details, details of the employer and other information. You may also see Letter of Application Forms. 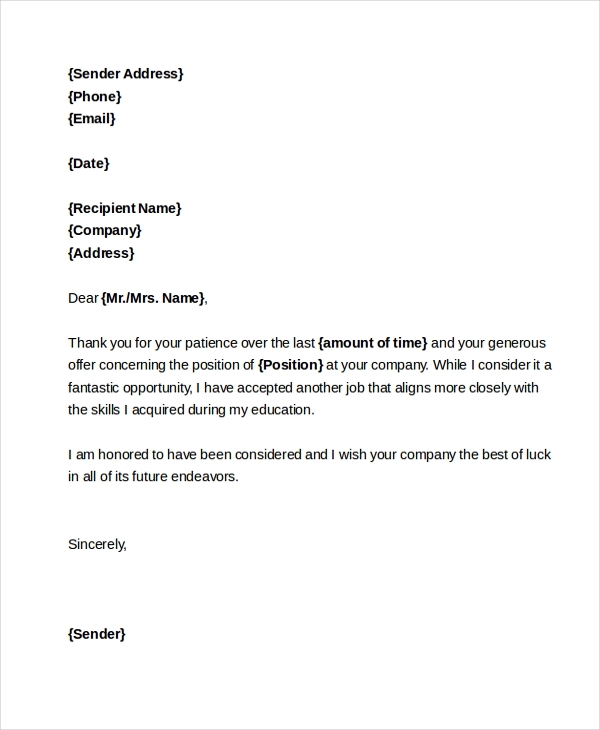 If you’re looking to send out a job acceptance letter via email, this sample letter is ideal for you. The user can copy, paste and edit the content of this letter and send it to his employer via email. You can also see Sample Letters of Recommendations. 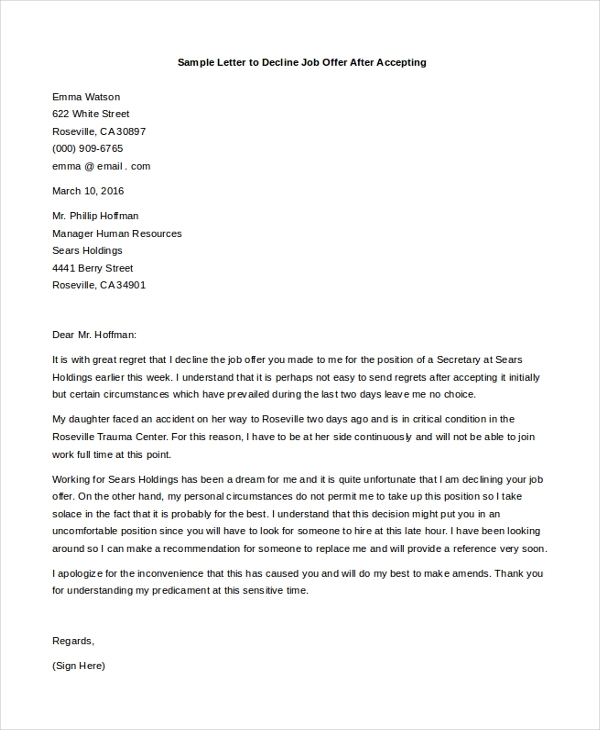 Professionals who have declined a job offer can use this sample letter and send out their apologies to the employer who has offered them the job. This template is available in Word format and is easily downloadable. You can also see Letter of Recommendation Samples. 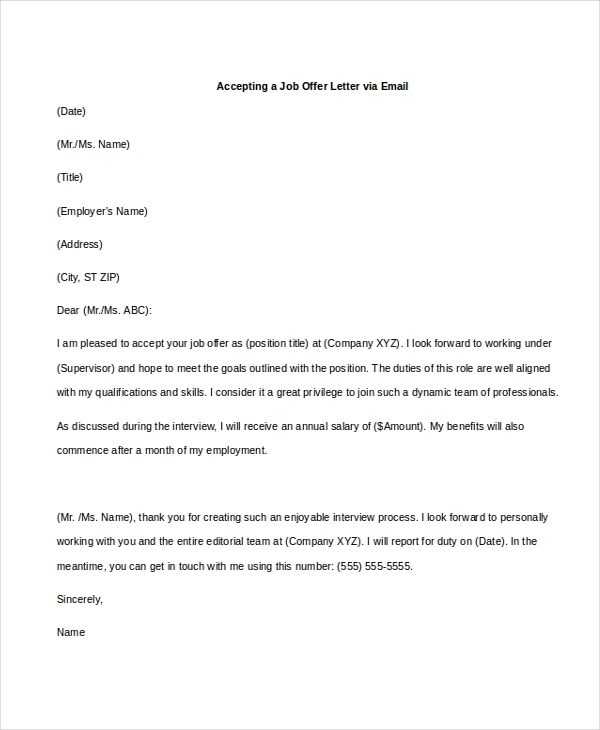 For those professionals who wish to accept a job offer, but have certain terms and conditions before accepting, this sample letter is ideal. The user can copy, paste and edit the content of the letter easily and quickly. The professional job offer acceptance letter is ideal for a sale manager who has just accepted a job at a new company. This letter can be copied, pasted and edited with ease. You may also see Job Application Cover Letters. What Are The Benefits Of Using The Job Offer Acceptance Letter Samples? These job offer acceptance letter samples are extremely beneficial for multiple reasons. First and foremost these letters are absolutely free of cost, making them accessible to all. Secondly, these letters are also beneficial because they are pre-drafted, thus the user doesn’t have to waste any of his time drafting a letter from scratch. Additionally, these letters are also beneficial because when sent out, the employer will get a very good, positive and professional image of the user. Lastly, these letters are beneficial because they available in convenient and universally accepted format. You can also see Sample Thank You Letters After Interview. Who Is The Target Audience For The Job Offer Acceptance Letter Samples? All kinds of professionals can use these letter samples. From sales managers to marketing executives, lawyers, chartered accountants, sales personnel, research analysts, project managers, human resources managers, back office and accounts staff members and various others will find these letters extremely handy. Typically, any professional who wishes to write a letter for accepting a job can use these samples. 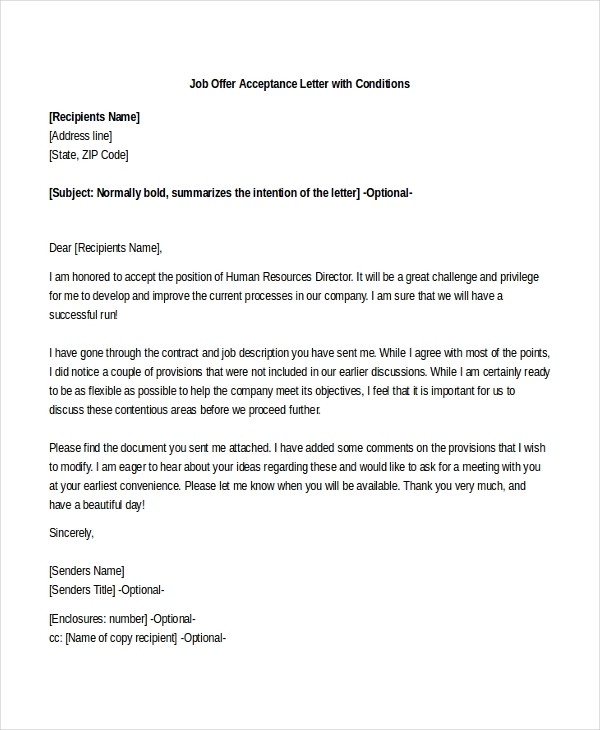 Even those professionals who wish to decline a job offer after accepting, or wish to negotiate the terms of job acceptance will find these sample letters very useful and handy. You may also see Formal Letter Formats. So, if you’re looking to send out a job acceptance letter to a prospective employer, these sample letters are ideal for you. Just select the one from the above-mentioned list that best suits your requirements, edit, print it or email it. You will find these sample letters save a great amount of your time and give a great impression of you to your new boss.